Jason “Soup” Williams, 35, an associate of the Supal Street Gang, is facing two counts of aggravated assault charges, as well as a charge for discharging a firearm in public. Williams was remanded to the Belize Central Prison after he was arraigned in the Magistrate’s Court Thursday morning. Williams pleaded not guilty to the three charges. He claimed that police saw a man with dreadlocks running and arrested him for the crime. The shooting incident occurred on Tuesday night in the vicinity of West and Bishop Streets. 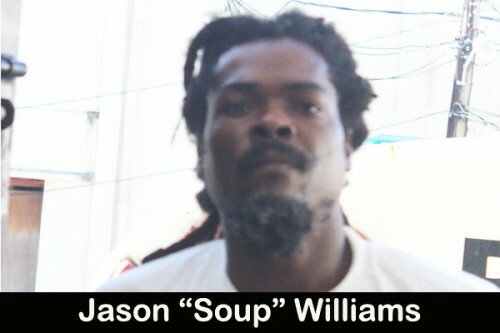 According to Police Constables #1308 Elvin Nah and #124 Jason Augustine, they responded to shots being fired in the area, and they saw a man with dreadlocks whom they identified as Williams, running. Williams, the two officers reported, opened fire at them, but missed. They fired back at him, but missed also. This alleged exchange of gunfire occurred at the corner of Bishop Street and West Canal. On that same night, two men – Tarique Tzul, 25, and Andrew Tate, 27 – reportedly connected to the George Street Gang, were sitting on a step at the corner of West Canal and King Street when a man wearing a white T-shirt opened fire at them. Police say as many as 15 shots were fired at the two men. Tzul was shot twice in the left upper leg, while Tate was shot in both arms, both legs and in the left side of the abdomen. Tzul was admitted in a stable condition at the Karl Heusner Memorial Hospital, while Tate is in a critical condition. But so far, police have not charged Williams for that shooting, because none of the injured men has given police an official report.